I've been wearing this Pure Copper Magnetic Bracelet pretty much all the time for a couple of months now. 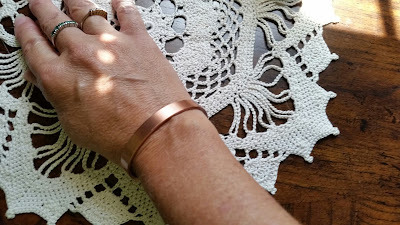 I've heard good things about the benefits of copper and magnets - being an Effective Natural, Non Invasive, Pain Relief Aid for Arthritis, RSI, Carpal Tunnel, Migraines, and Fatigue. This bracelet combines the two, being made from the Best Quality Solid Copper and including 6 Powerful Therapeutic Magnets, along with being sleek and stylish. This bracelet is a medium Size (6.5") and adjusts to fit most sized wrists. I have quite small wrists, so I have to squeeze it together until the ends almost meet. It then fits securely with the magnets against my wrist, but it is loose enough to push up my arm when I'm trying to work. I usually only take it off when I go out in the sun, since it's been summer, so I don't have a copper-bracelet-sized line on my arm. And then I put it on again. So far it seems to be holding up really well with all the squeezing and loosening of putting it on and taking it off. I can't say for certain what the benefits of wearing this bracelet have been, but I have had some pain in my right shoulder for a while now. I was trying to help Jeffrey carry parts of The Coolest Garden Ever, which he built in front of the house, and then they had to be carried to the back yard, and I ended up hurting my shoulder. Thankfully a very nice young man lives next door, and he helped Jeffrey carry the majority of the garden sides to the back yard. Anyway, my shoulder does still bother me occasionally, but I have noticed that it's usually on those evenings when I have taken the bracelet off and not yet put it back on. So, I'm going to believe that it's helping, and I would certainly rather use something natural like this than even think about pain killers or drugs or anything like that. I noticed that several reviewers (on Amazon) mentioned that the magnets in their bracelets fell out after just a few days, but like I said, I've been wearing this for a couple months, and I haven't had any problem with the magnets. They're all right where they belong. The bracelet is starting to look a little scratched up, because I do wear it all the time. While I like the smooth look of this particular style, I think I'd go for one with a braided or designed look, like this Mens Heavyweight Pure Copper Magnetic Bracelet (which I really wanted to order, but I knew it would be too big for my wrist), if I were to order another one. I think that would hide the wear better. The bracelet comes with the Magnetic Therapy eBook "Heal Your Pain Through Magnetic Therapy" by Dr Tulsi Dabhi along with a RISK FREE. 60 Day Earth Therapy Full Satisfaction Money Back Guarantee and a 1 Year Product Warranty. There are several other styles and sizes available. Be sure to scroll down to the Special Offers and Promotions section to see how you can save when you buy two or more Earth Therapy products. Disclosure: I received a Magnetic Copper Bracelet from Earth Therapy in exchange for my review. All opinions are 100% mine.